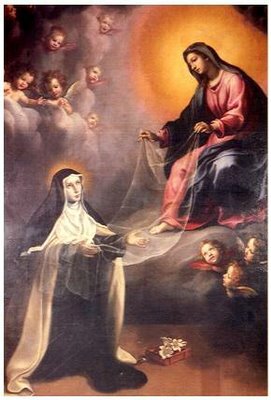 Today is also the feast day of St. Mary Magdalene de Pazzi, a Carmelite nun and mystic of the 16th century. She chose happiness when it was difficult and didn’t really make sense. St. Mary Magdalene de Pazzi: pray for us. ← St. Ven. Bede, "candle of the Church"
This is my first time to leave a comment,although I have visited your site a few times in the past. The posting for today, really touched my spirit. I suffer from depression and have often wondered or have difficulty with this type of thoughts or words spoken by a saint or lay person. I sometimes feel/believe that I must be doing something wrong, because I don't feel joy or a song in my heart most of the time. However, I do persevere to love Jesus more each day and to seek His Comfort and guidence. I want to have this type of diposition when things are difficult. I want to be a joyful follower of Jesus. Is it wrong to ask for some relief from this cross? I have read other things said by St. Mary Magdalene de Pazzi and her words fill me with some hope. Please forgive my rambling. In closing, I assure you of my personal prayers as your discern your vocation. May Jesus and His Blessed Mother always keep you near their side. I kindly ask you to remember me in your prayers as well. Thanks for your comments. I think of Mother Teresa and her battle to be faithful to God even in the midst of inner turmoil. Despite all that turmoil, to see pictures of her is to see joy personified. Same with St. Mary Magdalene de Pazzi and so many others. I think as long as we are faithful to God and hollow Him, that joy will come into our lives. If we keep ourselves open to the Holy Spirit, His fruit of joy will come to us. I think it would be prudent to seek relief from that cross! Depression is of course a medical issue. God has given us doctors and treatments for this; it's good, I think, to receive these gifts from his hands. I promise my prayers for you! Thanks very much for yours.